Janet Lopez and her family speak to Deputy Gilbert about a missing person investigation at the Coffee with a Cop event Friday, Feb. 7 in Palmdale. 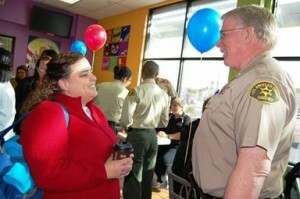 Captain Don Ford shares a laugh with a resident at Coffee with a Cop. PALMDALE – Coffee and cookies sparked conversation and camaraderie between local residents and Palmdale Sheriff’s deputies Friday morning. The Palmdale Sheriff’s Station’s first ‘Coffee with a Cop’ event was held at the McDonald’s, located at 131 East Palmdale Boulevard. The event drew a mostly positive crowd of about two dozen, according to Captain Don Ford of the Palmdale Sheriff’s Station. 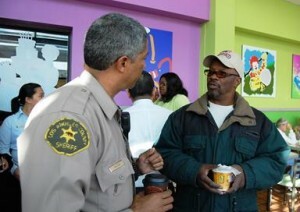 Palmdale business owner Rodney Ivey (right) said he came out to meet and greet the deputies. “Nobody came out with an axe to grind, they just wanted to meet the deputies,” Ford said. Laughter and chatter could be heard as Ford and about half a dozen deputies and sheriff’s Explorers socialized with residents. Deputy Jodi Wolfe sits for a chat with a resident. State Senator Steve Knight and Assemblyman Steve Fox were also on hand to meet residents and answer questions. Palmdale business owner Rodney Ivey said he had no public safety concerns; he simply came out to meet the deputies. Sheriff’s Explorers were also on hand to meet and greet local residents. East Palmdale resident Janet Lopez said her 17-year-old daughter, Destinee, has been missing since Jan. 10. Lopez said she couldn’t get anyone to return her calls, so she came to Coffee with a Cop to get answers about the missing person investigation. “I spoke To Deputy Gilbert and he said he’s going to help me out,” Lopez said, adding that she was encouraged that someone was finally paying attention to her daughter’s case. Rosalia Tamian said she came out to voice concerns about traffic hazards at Palm Tree Elementary School. “Some parents don’t respect the roads, they make double and triple lines to pick up their kids and it’s very dangerous,” Tamian said. She said she was satisfied that the officer she spoke with would take her concerns back to the station and have them addressed. “I gave him my opinions and he took notes,” Tamian said. Coffee with a Cop is a national initiative supported by The United States Department of Justice, Office of Community Oriented Policing Services. The event provides a unique opportunity for community members to join local law enforcement officers in an informal, neutral space to discuss community issues, build relationships, and drink coffee. 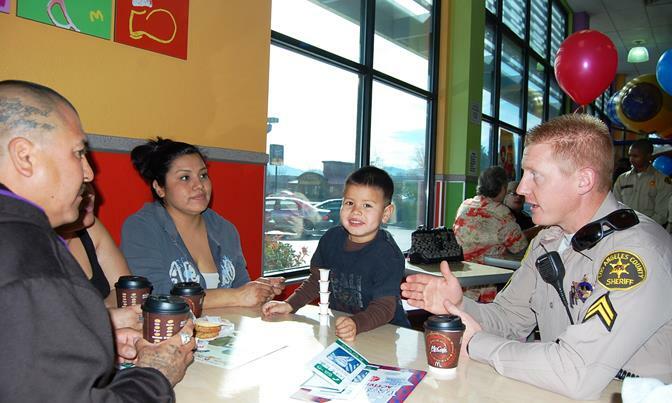 The Palmdale Sheriff’s Station will be hosting its next Coffee with a Cop event on Friday, March 7 at McDonald’s, located at 131 East Palmdale Boulevard, Ford said. Future events will be held on the first Friday of every month and will rotate to different locations, Ford said. For more information on Coffee with a Cop, contact Deputy Jodi Wolfe at 661-272-2520 or Deputy Ray Wilson at 661-272-2478. 11 comments for "‘Coffee with a Cop’ debuts to positive vibes"
Great idea! Maybe they can explian who is authorizing the random check points (supposidly) that are constantly set up on the Eastside of Palmdale. These checkpoints have no purpose but to impound vehicles from undocumented human beings living in Palmdale. Maybe we should request assistance from the Department of Justice to look into this? Perhaps the DOJ can investigate the identity theft many of these illegals are committing when stealing a social security number to gain employment. They steal the number, claim 10+ on their withholdings and royally screwing over the person whose identity they’ve stolen. It’s a felony as well. Let’s not mention what other aid and benefits they are getting using this stolen identity. I’ve seen it take years for an identity theft victim to fix their credit and get the IRS off their back. So deputies impounding cars of people here illegally, driving without a license…and the cops are the problem? Why did the lady have to go to coffee with cops in order to get something done about her missing daughter? You would think a missing child would be a top priority. I think it’s a good idea to have meetings with citizens and cops and they should do it at least once a month, but, this seems more like a publicity thing for the sheriff’s dept after all the bad publicity they are going through right now. If you read the article, it is a national event, not just something local. Because that does not bring them money. Now call and tell them that the guy growing pot next door bought a new car. Oh they ‘ll be there in a heartbeat for the beautiful asset forfeiture. I am pleased to see that they had actual front line cops at this event, instead of just the community schmooze patrol cops. Good move on their part. Ganga with a gangster premiers next month along with meth with a maniac. I would have to disagree on the priest part. On going of scandals of Catholic priests in particular.